The college football team that has gone the longest without losing at home resides in Conference-USA. That would be UAB, which technically hasn't lost at Legion Field since November 2014 since the Blazers didn't have a football program in 2015 and 2016. While the Blazers' six-game winning streak just barely missed the cut to be included among the 14 longest active home winning streaks in the country, you wouldn't have to travel far from Birmingham, Alabama, to reach the home stadiums of two schools that are on the list. Alabama, which won the national championship last season, and Auburn, which beat No. 2 Georgia and No. 1 Alabama at home last November, have won more than 30 home games combined since both teams last lost at home. Here are the schools with the longest active home winning streaks entering the 2018 season. Army went undefeated in West Point last season, including four wins by a combined 13 points against Buffalo, Eastern Michigan, Temple and Duke. The Black Knights beat the Eagles 28-27 after Eastern Michigan's two-point conversion attempt with 49 seconds left in the fourth quarter failed and Army beat Temple by a field goal in overtime. After losing to Navy in its season opener, Florida Atlantic rattled off seven straight wins at home, many of which came in blowout fashion. The Owls won games by 24, 28, 38, 45 and 47 in Boca Raton. North Texas, which was on the losing end of 41-17 and 69-31 games on the road against FAU, went undefeated at home in 2017. The Rockets have been a tough out in Toledo as they have a 31-6 record at the Glass Bowl since 2012. Former UCF coach Scott Frost oversaw a remarkable turnaround for the Knights as they went from 0-12 in the season before Frost's arrival to 13-0 in the span of two years. They finished the season with three consecutive wins over ranked opponents, most notably No. 7 Auburn in the Peach Bowl. Seven of Washington State's nine wins last season came at home, including three-point wins over Boise State, USC and Stanford. The victory over the Broncos came in overtime, beating the Trojans required a go-ahead field goal in the final two minutes and the Cougars pulled off a come-from-behind win in the fourth quarter against the Cardinal. No one came within a touchdown of Clemson when the Tigers played at home last season. They beat Auburn 14-6 in Week 2 and the rest of their home wins were by 14, 14, 17, 27, 53 and 58 points. If Clemson had defeated Pitt in November 2016, Clemson could have an active 30-game home winning streak dating back to 2013. There are a few strange aspects to Stanford's last home loss. The obvious one is the score, 10-5, which is because Colorado took a safety in the game's final seconds to prevent Stanford from potentially returning a punt for a touchdown or taking over on offense with a short field. Plus, Colorado is arguably one of the more unlikely teams to beat Stanford at home in the last decade or so. Since 2006, Colorado has only had one winning season and the Buffaloes are 50-99 during that stretch, but they did manage a 10-win season in 2016, when they beat the Cardinal. The Huskies went undefeated at home last season, one year after they won the Pac-12 and made the College Football Playoff as part of a 12-2 season in 2016. In its last home loss, Washington scored first with a field goal against USC in 2016 but the Huskies never led again. Wisconsin was on the verge of taking an undefeated record into the final week of last season's College Football Playoff rankings but the Badgers fell 27-21 to Ohio State in the Big Ten Championship. The Buckeyes are also responsible for the Badgers' only home loss in the last two seasons. Auburn jumped up the College Football Playoff rankings last season after wins over No. 2 Georgia and No. 1 Alabama in the span of three weeks. The Tigers also beat Mississippi State and Ole Miss at home in consecutive weeks earlier in the season. You could make the case the Big Ten East is the toughest division in college football and Penn State has put together back-to-back seasons with an undefeated record at home. The Nittany Lions have beaten division foes Ohio State, Michigan State and Michigan, plus Iowa and Nebraska at home in the last two years. Three of the eight longest active home winning streaks are owned by teams in the Pac-12, the most of any conference. The Trojans lead the way among West Coast teams with two and a half seasons of undefeated play at home. That stretch includes wins against every other Pac-12 team besides Washington and Washington State, plus victories against Notre Dame and Texas. Just think about this for a second: there are juniors on Alabama's roster who have never lost at home. 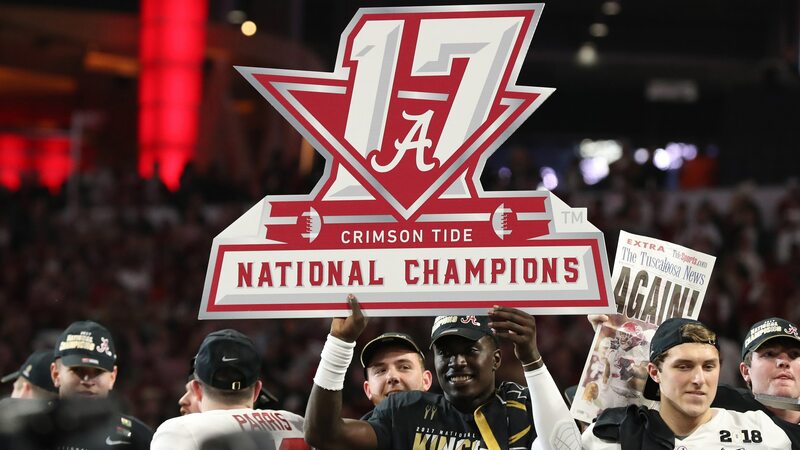 Ole Miss ruined Alabama's bid for a perfect season in 2015 but the Crimson Tide had the last laugh by winning the national championship. Get this, Alabama played nine opponents that season who were ranked at the time of the matchup – No. 1 Clemson, No. 3 Michigan State, No. 4 LSU, No. 8 Georgia, No. 9 Texas A&M, No. 15 Ole Miss, No. 18 Florida, No. 20 Wisconsin and No. 20 Mississippi State – with just two of those games at home and only the Rebels got the best of the Tide. *Note: Memphis has an active eight-game home winning streak during the regular season and Miami (FL) has a nine-game home winning streak during the regular season but both the Tigers and Hurricanes lost in bowl games that were played at their home fields.